*while this isn't a post specifically aimed at skin care, i believe that our whole body, mind, lifestyle and environment affect our skin. therefore, i'm passionate about occasionally incorporating more "lifestyle" based posts, like the one below. enjoy! i took some time over the holiday break to unplug and reflect on 2016. i realized that i'm proud of the personal and professional growth that happened in my life over the year, and for it i'm incredibly grateful. however, coupled with this satisfaction i also recognized some patterns and habits that i desire to improve in: this required an open heart and mind to realize (and it's incredibly humbling), but growth doesn't happen without a little pain. the reflection stage was essential in order to form the positive and practical intentions i have for the upcoming year. there's something so mentally refreshing about clearing the excess from your life, especially when it comes to the clutter in your house, office, bathroom etc. (places you spend the most time in). 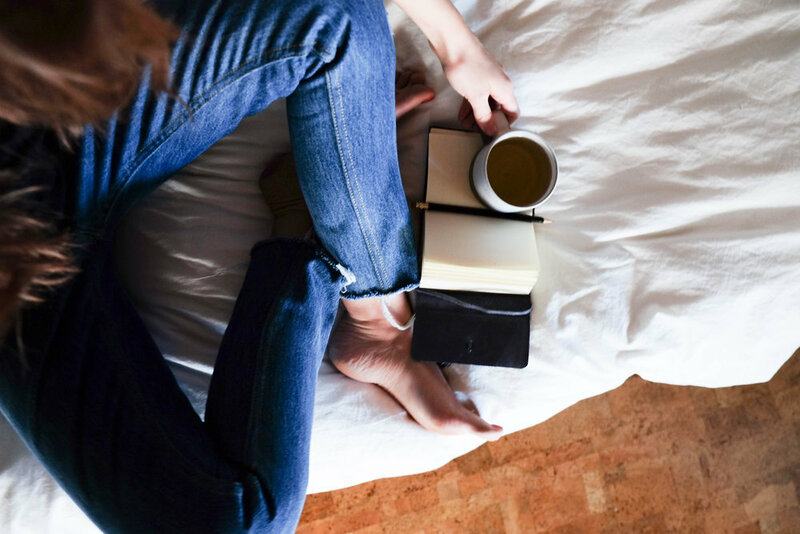 i have made a habit of going through the clutter on a quarterly basis, and every time i do i feel like a brand new person: my thoughts are clearer, i don't feel as stressed, and my spaces look more beautiful and clean. daily tea time (ideally accompanied by a book). working out. i take barre3 classes a few times a week which help reduce stress and make me feel more balanced and happy overall. in the summer and fall when it's not freezing cold outside, i go on daily walks around my neighborhood. a hot bath or sauna. what are some of your go-to's for starting out a new year on the right foot? i'd love to hear. cheers to a brand new year; i hope this one is full of beauty for you!